Caught between high-volume discount salons and high-end mega-spas? Rather than try to win by their rules, write your own rules geared to a more narrow and tailored clientele and create your own niche. 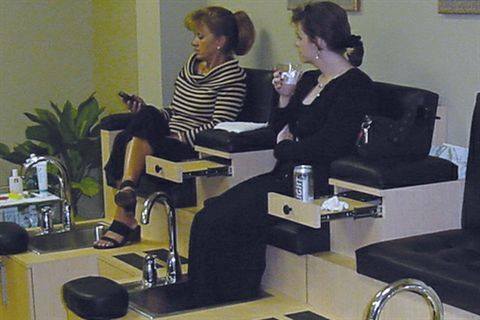 Although you would never know it from the pages of NAILS, many U.S. salons have a distressing sense of sameness. White walls, generic posters, light-colored laminate stations … whatever happened to individuality? Why can’t I find in my hometown of Atlanta the salon so lovingly stereotyped in Steel Magnolias? Where are all the charming beach bum salons that should dot the stretch of Pacific Coast Highway in my childhood haunt of Laguna Beach, Calif.? Have we as an industry gotten so caught up in the science of price vs. value that we’ve forgotten the art of engaging the emotions? With more than 40 nail and full-service salons in a five-mile radius of my suburban Atlanta office, I have little choice in where to get my nails done: Only a handful of the 40+ salons and spas even attempt to make a statement, and none happen to resonate with me. I might as well — and often do — allow convenience and price to guide me. Rather than focus on setting a price or speed of service that appeals to the broadest base of potential clients possible, some salons are proving the worth of narrowing your sights on a particular type of client and becoming all that you can for them. If your area is anything like Metro Atlanta or South Orange County, Calif., you will compete in a league of your own. But don’t take our word for it: Check out what the owners of these five niche salons have to say. Nor did she find the men in her life unique in their views: As a cosmetologist, Cassidy had more than one male client who asked to book after-hours appointments for a pedicure and hair color. Fast, perhaps; feel-good, definitely. Living with dry desert heat year-round, guys especially like the cool rubdown that kicks off every manicure. “We cleanse the hands with terrycloth mitts dampened with astringent,” Cassidy says. Every nail service also includes a paraffin dip to soothe dry skin and torn cuticles, which are common hand conditions for men. The challenge lies in getting them through the door. “Men get a haircut or a manicure, and no one asks where they went,” Cassidy asserts. Instead, she relies on Boxers’ highly visible downtown location as well as poster ads at transit stops. She also seeks unique promotions such as one Boxers recently held in partnership with a law firm that represents Harley owners. Boxers also hosted an all-day haircut station at Bank One Ballpark. Targeted marketing of gift certificates to the woman in his life works as well. And Cassidy knows they’ll tell their friends just what they got — and where. As music videos play on 16 strategically placed screens, the energy in Seventeen pulses with the beat as teens play games and preview the latest movie releases in the technology center, experiment with new looks at the makeup bar, or join a group of friends for a foot fix-up in the pedicure pit. 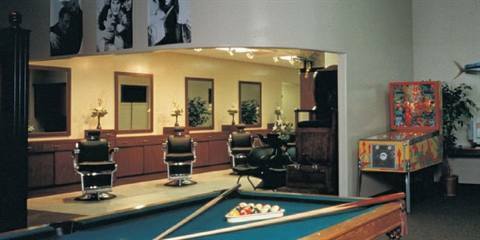 With nine high schools within a seven-mile radius, Seventeen Studio.Salon.Spa in Plano, Texas, has no shortage of potential clients. Fortunate — not to mention very smart — to leverage an existing relationship with Seventeen magazine, owner and founder Susan Tierney has tapped the teen market in a way that had the new salon hopping within weeks. Billed as a place “just for you!”, the 8,700-square-foot studio features a full-service spa, 12 hairstyling stations, a retail store, a “sushi-style” manicure bar, the pedicure pit, and a cyber café with interactive kiosks. The 12- to 24-year-old target market wants it all — and Tierney delivers with style. “In our market research we found that 10- to 12-year-olds are getting highlights, and 25% of our hair color business is boys, who want their tips colored.” Skin care, of course, is a given as acne rears its ugly head. While manicures and pedicures let friends “hang 10” together. Seventeen could do a lot more, if Tierney could only find additional qualified nail techs (the salon currently has only three). “We turn away nail business because we have a hard time finding qualified staff,” she admits. To this end, she hopes to cultivate future staffers among her young-but-enthusiastic clientele. Nor does bearing the Seventeen brand name hurt — in addition to ads in the top magazine for 12- to 24-year-olds,Tierney has access to the magazine’s mailing list as well as links on Teenmag.com and Seventeen.com. “Our website gets half a million hits per month,” she says proudly. And Tierney makes no secret of mega-brand dreams herself. “We are going to open 37 locations by the end of 2006,” she asserts. When Medicare stopped covering routine foot care for older clients several years ago, podiatric assistant Kelly Willis was as distressed as the patients whose feet she cared for. Having observed firsthand their difficulties in caring for the nails and skin of their feet, she thought none of them could afford to forego her services — yet few had the resources to pay out-of-pocket. Restless in the rut of a 9-5 office job, Willis realized that Medicare’s move might be to her and the patients’ benefit. 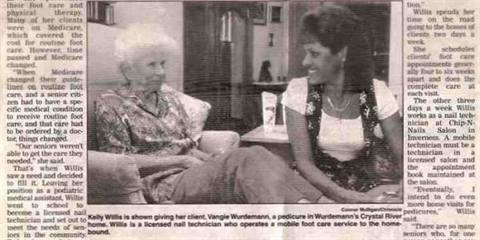 As a freelance pedicurist specializing in servicing older and disabled clients in their own homes, she could be her own boss and schedule her own time. The podiatrist for whom she worked not only gave her his blessings but also promised to refer patients to her for routine care. Another podiatrist she knows across town also loved her idea and promised additional referrals. Today, Willis has established a regular route servicing homebound clients from her home in Lecanto, Fla.
As for herself, Willis loves the freedom of scheduling her own hours. “I like working when I want to,” she says. “The only good thing about working in an office was the benefits.” By the same token, Willis cautions fellow nail techs from following in her footsteps. “My training as a podiatric assistant and the eight years I spent working in a medical office are what qualify me to service elderly feet,” she explains. “You’ve got to be able to understand clients’ medical history and what medications they take, and how those things determine what you can and can’t do.” For example, she says she does not massage the feet of clients who have high blood pressure. “They teach very little about foot and nail conditions in nail school,” Willis underlines. “My business has boomed because of my medical background. I’ve tried hiring nail techs to work with me, but most of my clients weren’t happy with their services.” She also expresses concern that untrained eyes might miss symptoms requiring a doctor’s attention. Willis also leverages her background to source her supplies. For example, she uses a medical-grade electric foot file and sanding disks and the same skin antiseptics and equipment disinfectants as a podiatrist. “I don’t know of too many other nail techs who would spend $95 on a set of toenail clippers,” she says. Everyone is welcome at BodiScience in Peabody, Mass., but owner Dawn Tardif doesn’t expect just anyone to become a regular client of the Ayurvedic spa. “Our typical client understands that nurturing behavior takes time and is not something you can do once a year,” she explains. A trained Ayurvedic practitioner, Tardif credits what she calls an innate sense of wellness to her grandfather, an American Indian. “I have always questioned the traditional medical establishment, and it alarms me that people are so unaware that the true essence of beauty comes from spiritualism,” she explains. BodiScience tailors services to fluctuations of the Chinese calendar to promote seasonal harmony of the skin and nails. For example, fall is what she calls the metal season. Skin tones become less vibrant due to mineral loss, so BodiScience switches to mineral-laden products. “In winter we use more rosemary to stimulate circulation and create warmth,” Tardif offers as one example. Other aspects, such as warm stones and Tibetan techniques in hand and foot massages, remain constants. Within three months of opening, BodiScience was almost fully booked, and the spa has expanded three times since, to 2,500 square feet. BodiScience also taps potential clients through strong cross-referral programs. Tardif works with a local women’s center and cross-markets with a local chiropractor and acupuncturist. Through copious research and months of experimentation, Gregory developed techniques that enhance natural nails and found a product line out of Switzerland she says hydrates and heals hands and nails. Next, she focused on a way to deliver the approach in a profitable setting. The result: Natural Nail Care Clinic (NNCC), headquartered in Williamsburg, Va., which uses a proprietary workstation set-up and system that allows two to four nail techs to service six to 12 clients at one time. Make no mistake, however: This is no assembly line volume-based salon. Clients receive extensive education along with in-depth consultations and personalized recommendations. For example, at the first visit, a technician analyzes the client’s nails and explains nail anatomy as well as some ways in which the client may be hindering nail health. “We discuss our four-part program (hydration, maintenance, protection, and glamour) in a way to help them develop a relationship between their lifestyle and their hands,” Gregory explains. Technicians recommend a comprehensive home care package that clients are urged to follow daily for optimal nail health. Far from costing NNCC business, Gregory says the NNCC locations average retail sales of $3,550 each month, and each client spends an average of $45.50 per visit. 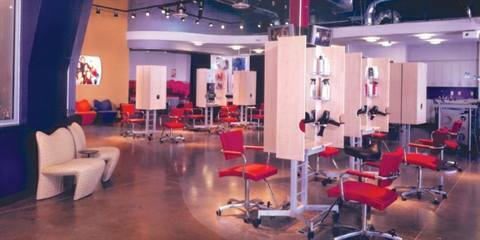 NNCC locations can be freestanding nails-only salons or can be incorporated into an existing spa or salon. Adam Broderick Image Group in Ridgefield, Conn., for example, recently re-opened the spa’s nail care center using the NNCC programs and methods. Currently, 22 NNCC locations are open nationwide, with an additional 12 opening soon.